In celebration of its 50th anniversary, Cañada College will launch a pilot shuttle program that will provide residents with direct access to the college campus. 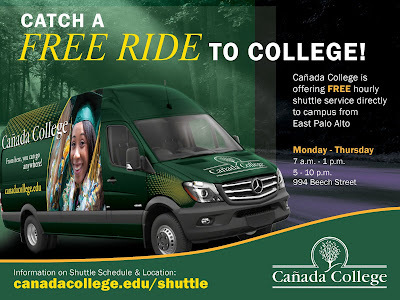 Starting August 15, Cañada College, will offer free, direct service between East Palo Alto and the campus- in collaboration with Mosaic Global Transportation and Oxford Day Academy. The shuttle service will run every hour from 7 a.m. - 1 p.m. and 5-10 p.m., Monday through Thursday. Pick-up will begin in East Palo Alto at 994 Beech Street and will drop off in front of the College’s Main Theatre at Building 3. The shuttle program will create convenient connections for several students and employees residing in the East Palo Alto, Menlo Park and Belle Haven communities. The shuttle will be open to students, faculty and staff as well as community members who utilize the services available on campus such as SparkPoint, the Library and the DREAM Center. In addition, those who come to campus to attend athletic, performing arts or other college events can also take advantage of the convenient service. The shuttle serves as a pilot program that will run through December 31, 2018. Towards the end of the pilot, the College will evaluate the program and explore the possibility of expanding locations to accommodate other service area. For additional information on the shuttle and its schedule, visit www.canadacollege.edu/shuttle.